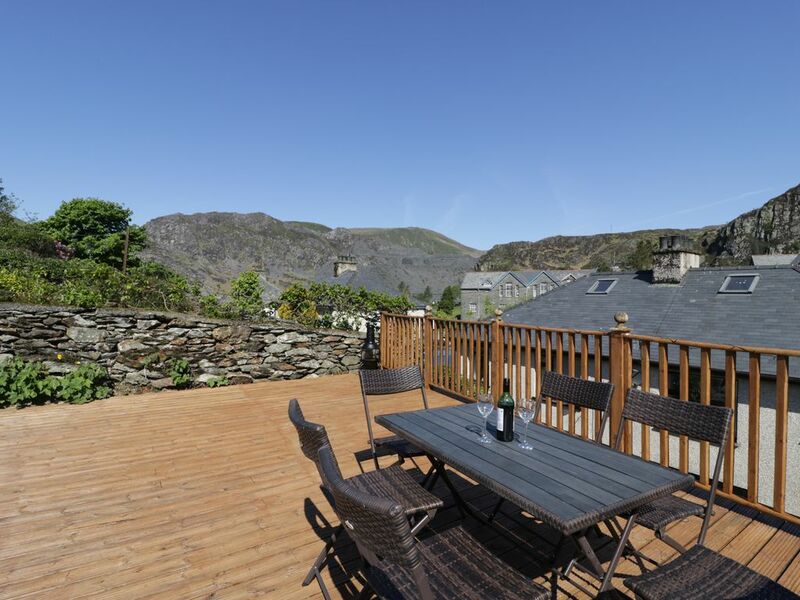 A superb semi-detached cottage near the town of Blaenau Ffestiniog in North Wales which can sleep six people in three bedrooms. Pen Y Garreg is a superb semi-detached cottage near the town of Blaenau Ffestiniog in North Wales. The cottage can sleep sicx people in three bedrooms which are made up of a king-size double, a double and childrens bunks as well as a separate bathroom. The rest of the cottage is made up of a kitchen, external utility, a dining room with electric fire and a sitting room with gas fire. To the outside is off road parking for one car with additional free roadside parking at the front of the cottage on a first-come, first-served basis as well as a rear courtyard and tiered, terraced garden with elevated decked area with furniture and lawned garden. Also has hot tub. Set in a wonderful setting, Pen Y Garreg can be enjoyed at any time of the year. Note: The hot tub can not be used after 10pm as this is a residential area. Amenities: Hot tub - Children must be supervised at all times. Gas central heating with gas fire. Electric oven and hob, microwave, fridge and dishwasher, freezer, washing machine and tumble dryer in garage. 2 x Smart TVs with Freeview in bedrooms, 1 x TV in sitting room with Sky Q, DVD, WiFi, USB ports, Nintendo Wii, small selection of books and games. Fuel and power inc. in rent. Bed linen and towels inc. in rent. Travel cot and highchair available. Off road parking for 1 car with additional free roadside parking at the front of the cottage on a first-come, first-served basis. Garage for bike storage with bike stand and tap in garage for cleaning bikes. Rear courtyard and tiered, terraced garden with elevated decked area with furniture and lawned garden. Sorry, no smoking. Shops and pubs 5 mins walk. Note: Main bedroom when made up as a twin are 2' 6" single beds. Note: Garden is accessed up several steep steps, children must be supervised and care to be taken at all times. Note: The hot tub may not be ready for your arrival depending if had back-to-back bookings. Note: The hot tub can not be used after 10pm as this is a residential area. Town: The fascinating town of Blaenau Ffestiniog is situated in a superb position for exploring the Snowdonia National Park. There is a good selection of shops, pubs and places to eat. The main local attractions include Zip World Slate caverns, the longest zip line in Europe and fastest in the world, this is a great underground adventure. The slate mines - where visitors can take enthralling underground trips to see mining as it was done in days gone by - and the famous narrow gauge Ffestiniog mountain railway. Three bedrooms: 1 x king-size double with Smart TV (zip/link so can be a 2' 6" twin on request), 1 x double with Smart TV, 1 x bunk bed. Bathroom with bath, shower over, basin and WC. Kitchen. External utility. Dining room with electric fire. Sitting room with gas fire. Hot tub - Children must be supervised at all times. Gas central heating with gas fire. Electric oven and hob, microwave, fridge and dishwasher, freezer, washing machine and tumble dryer in garage. 2 x Smart TVs with Freeview in bedrooms, 1 x TV in sitting room with Sky Q, DVD, WiFi, USB ports, Nintendo Wii, small selection of books and games. Fuel and power inc. in rent. Bed linen and towels inc. in rent. Travel cot and highchair available. Off road parking for 1 car with additional free roadside parking at the front of the cottage on a first-come, first-served basis. Garage for bike storage with bike stand and tap in garage for cleaning bikes. Rear courtyard and tiered, terraced garden with elevated decked area with furniture and lawned garden. Sorry, no smoking. Shops and pubs 5 mins walk. Note: Main bedroom when made up as a twin are 2' 6" single beds. Note: Garden is accessed up several steep steps, children must be supervised and care to be taken at all times. Note: The hot tub may not be ready for your arrival depending if had back-to-back bookings. Note: The hot tub can not be used after 10pm as this is a residential area.